I am a firm believer that everyone at some point in their lives can benefit from therapy to help them better understand themselves, learn how to cope with difficulties in their lives, and make intentional choices and decisions. In my own life, I’m not sure how I would have survived the multiple stresses of graduate school without my own therapy! At the same time, I’m aware that therapy is a huge investment in time and money. Although some people are able to comfortably afford therapy, for others it is a struggle. When I worked in college and university counseling centers, that investment was made up front as part of student fees, so I was able to work with students who might not otherwise be able to afford therapy. Working in the community requires me to think about other ways that I can be more accessible to clients. 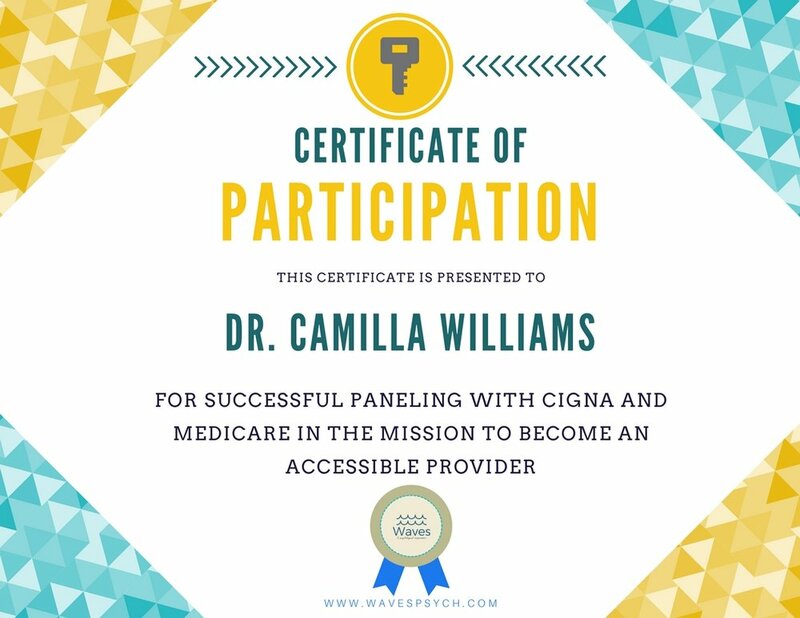 To that end, I’m excited to share that I have been accepted as an in-network provider for both CIGNA insurance and Medicare. And finally, I reserve a percentage of my time for lower fee services through Open Path Psychotherapy Collective for people who aren’t able to pay my full fee. My hope is that offering these options will make it easier for people to afford to make the investment in themselves and their health. If this affects you and helps you make that decision, I hope you’ll contact me for an appointment soon. Please contact me by clicking on the button below or by emailing me directly at drcamilla@wavespsych.com.